Butter will make the right person or family the perfect companion. A little over 2 1/2 years old, 65 lbs +, neutered, shots current, crate trained, leash trained and house trained. Extremely healthy, energetic and strong. Keeps strangers out of fenced areas and homes he knows as his domain. Tends to be a little rough when playing. I don't believe he realizes his own strength. Enjoys being close while in doors. Enjoys going for rides in the car or truck. Caution needs to be taken when other male dogs are present. Adopter must be observant to the surroundings protecting him from being able to come into contact with other male dogs. Butter is extremely dominate and will engage them. First time pet owners and apartment dwellers are not recommended as applicants. 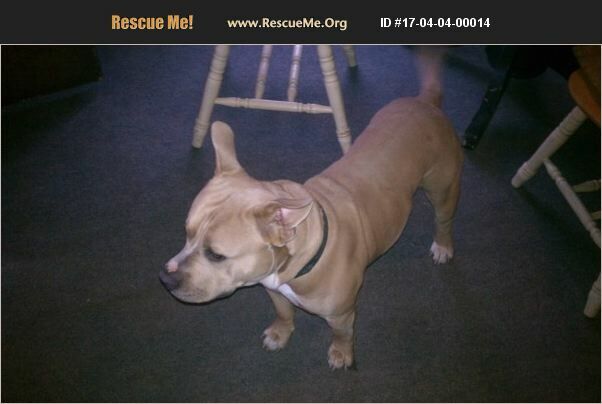 Butter needs a pit bull knowledgeable forever home. Applications carefully processed to insure he doesn't end up being fought and must be returned to this rescue if for any reason adopters have to give him up. Butter is wonderful, yet it's the ultimate duty of his adopters that he is protected from his own territorial instincts to be the alpha male. He is not to be trusted against other males neutered or not. Tail wagging he WILL engage. That's got him injured more than once. He has to be placed like yesterday for his own good before more injury to him and other males. He always finds a way to get to them. Not good and on top of that he always jumps in over his head.